E-commerce may be worth billions globally, but it can be difficult for smaller web retailers to get a piece of the pie. The majority of consumer purchases are made at established giants like Amazon, or from retailers the customer has used before. Of those transactions that remain, the buying journey most often begins with an informational web search, where the customer doesn’t yet know enough about a product category to zero in on a purchase. But while they’re not yet ready to buy, they’re definitely a lead worth acquiring. If you can place your brand in front of a customer at this early stage, there are rich pickings to be had, rather than crumbs off the major players’ table. And one of the best ways to do this is to use high-quality content to capture curious web users and guide them toward becoming customers. A content funnel is often used to achieve this aim. The idea is to produce content that speaks to a customer at every stage of the buying journey, leading them ultimately to your checkout page. 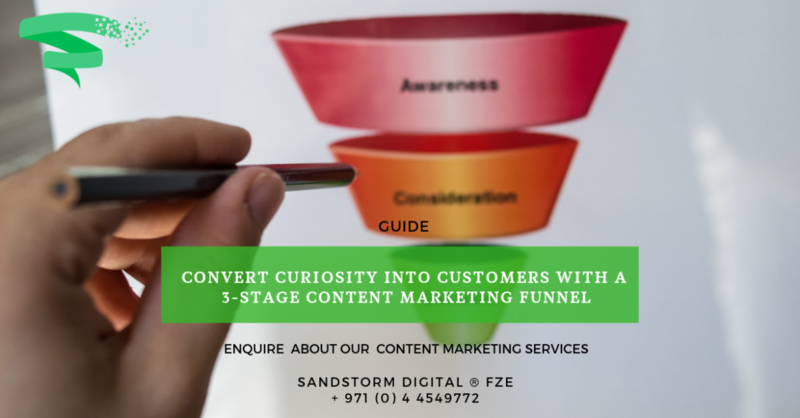 A simple content funnel can be divided into three sections. Most web activity is related to entertainment, exploration, or education. Your prospects may not yet know they’re interested in your product type, or they may be casting around for more information while deciding on their precise needs. To catch a customer at this stage, you need to offer content with genuine value, and without an overt sales motivation. Build interesting, informative, or amusing content around your general niche. Focus on a broader range of product types rather than any individual offering. Promote this content on social media, via search engines, even through paid advertising. The aim is to grab as much attention as possible from visitors who have an interest in your area, but who don’t yet have a specific transaction in mind. In essence, stage one is all about building a brand and generating relevant exposure. However, make sure this most general content provides an easy path into the more product-focused stage two for those readers who want a little more. Capturing attention is a largely wasted effort unless you can engage the customer somehow. You need to plant your brand in their mind so they’re ready to consider a purchase from you later. This is done by giving the visitor content that’s impressive enough for them to come back for more. The key to this is creating content that addresses a real-world need, provides a solid benefit, or solves an urgent problem. Make the reader feel satisfied and grateful they’ve come across your work. Once you’ve impressed a curious browser, you can turn them into an engaged lead by offering a pain-free, no-risk conversion. – Invite them to join an email newsletter to stay informed about new content you publish. – Offer hidden, premium content in exchange for their email address. – Encourage them to follow your brand on social media. As well as offering these easy conversions, add pointers to your more specific money pages featured in stage three, for those who’re ready to delve deeper. The final stage is where the actual conversion action takes place. The content here is less about information and advice, more about convincing waverers that their buying journey’s end is in sight. You can use subtlety or outright sales pressure, it’s up to you. But the aim is to highlight the undeniable, irresistible benefits of your product using all the marketing and copywriting techniques you have in your arsenal. The idea is to leverage the branding and reputation you’ve built in the first two stages to give the reader that final push into converting. This isn’t going to be done using a bare checkout button; you need compelling content to provide the all-important nudge. 1- Let the potential customer know you’re there, and spark their interest in some area related to your business. 2- Establish your reputation by providing free value with no strings attached. Then, nudge your reader towards your commercial solution to a specific need. 3- Use laser-targeted content focused on conversion for individual products. But remember, this three-stage funnel is a fluid structure. Customers won’t necessarily follow predictable steps from one stage to the next. The attention-grabbing process can take many, many brand impressions to develop recognition and trust. Nurturing in stage two often takes several attempts to guide the prospect into buying mode. You may also need to add extra stages with increasing focus if your products span a large range. However, quality content is key in all the stages. Aim to move your prospects down the funnel as efficiently as you can. If your content is providing solid value along the way, the effects on branding and business will all be positive. Peter is one of Sandstorm's brilliant freelance copywriters. He's been working in writing, content development, and online business for over 15 years, of which a decade was spent as content and marketing manager for a credit brokerage. His writing experience covers diverse topics including finance, marketing, business, travel, and health.